In an era when sailing the inland seas was considered de rigueur, the SS Noronic, flagship of the Canada Steamship Lines and the largest passenger cruise ship on the Great Lakes, sailed more than a thousand safe voyages in her 37-year career. There was no reason to believe another voyage from Windsor and Detroit to the Thousand Islands and back would be any different. But on the night of September 16, 1949, docked in the safe harbour of Torontos famed Pier 9 at the foot of Yonge Street, she became a deadly inferno  in just fifteen minutes. Waves reached a height of 35 feet; on Sunday, November 9, the wind blew for 16 straight hours in excess of 80 miles an hour. From the head of Lake Superior down to the mouth of the St. Lawrence River, ships and crew fought a life-and-death battle for survival. Eleven vessels went down with all hands lost; eight others were completely destroyed, with 20 more left stranded on reefs and islands. Worse still, more than 250 able seamen lost their lives (look for The TIMES coverage of The Great Storm of 13 in a future issue). Scheduled to leave on her maiden voyage on the day of the storm, the Noronic instead stayed safe and sound in Port Arthur (now Thunder Bay), Ontario. She was 362 feet long with a 52-foot beam. Her draft was 28 feet and a gross tonnage of 6,095 made her a large vessel for a lake cruiser. She had originally been ordered by the Northern Navigation Company, but later was sold to the Canadian Steamship Lines for its Great Lakes passenger fleet. A few days after The Great Storm of 13, the Noronic set sail from Port Arthur to Sarnia, which remained her home port until her tragic demise. The Noronic at port in Detroit. The Noronic had an impressive pose when docked, as she towered over the land by five decks. In her glory days, she epitomized the ultimate in Great Lakes cruising  the likes of which we shall never see again. The Noronic was one of the finest ships ever to sail on the Great Lakes. First-time passengers marvelled at her great dining room, the length of her promenade decks, the curving sweep of her carved staircases, her teak, cherry and oak walls, the pampered comfort of her staterooms. The Noronic was known on both shores as The Queen of the Inland Seas. In the early days, she seldom sailed without a band in attendance. 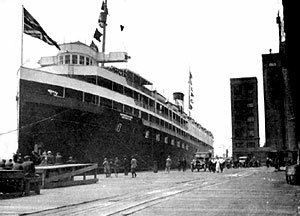 After leaving Detroit on her northern route, she headed to Point Edward and an eight-hour layover while she took on supplies. For onshore entertainment, passengers were ferried to Canatara Park, where they were served a sumptuous lunch by shipboard waiters and waitresses, complete with white linen tablecloths, shining silverware, and chilled wines! Her outstanding feature was the great dining hall, offering a panoramic view through giant floor-to-ceiling windows and fresh-cut flowers on each table. The ships cuisine was equal to the great restaurants of the day. 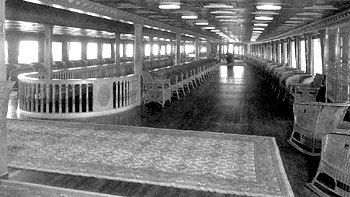 The observation lounge on B deck included large windows and over-stuffed leather chairs. At night, it was converted into a ballroom, and the ships resident orchestra provided live music for dancing. Bingo games, euchre tournaments, gala costume balls, writing rooms, a full library, a music room, buffet bars, souvenir stands, supervised playroom for children, barber shop and beauty parlour kept the patrons busy. Passengers were provided with a daily newspaper-printed on board! The Noronic plied the waterways between Canada and the United States for years, as did her sister ships, the SS Huronic and the SS Hamonic. As if a harbinger of things to come, the Hamonic caught fire in 1945. The dock itself was on fire and the crew were unable to build up enough steam to get her out of harms way before the ship caught fire. Fortunately, since the fire was on the dock, passengers and crew had fair warning and were able to escape. Only one fatality was suffered in that event. By 1949, the Noronic was 36 years old, yet still considered the finest and largest ship of her kind afloat on the Great Lakes. She had never once been in dire peril from the weather, nor did she ever once call for assistance while cruising the lakes. In the early 20th Century, lake travel had become primarily a means of pleasure. Dozens of luxuriously equipped vessels plied the waters of the great inland seas, offering everything from one-day excursions to two-week cruises. For nearly 100 years, from the early 1800s, packet boats with a dual freight and passenger role were the predominant mode of transportation within the region. However, as vessels grew in size, and iron hulls and steam power advanced in sophistication, the demand grew for ships that were in fact floating hotels rather than freight boats. Vessels became quite luxurious  rivalling the quality of accommodation on the great ocean liners of the day. Overnight cruising also came into its own, and by the 20s and 30s, there were many lines offering ships with all levels of accommodation. The Chicago, Duluth and Georgian Bay Transit Company operated two well known vessels, the North American and South American that offered 7-day cruises between Detroit and Duluth or Detroit, Montreal and the Saguenay. The South Americans last voyage, after 50 years service, was in 1967, to the Montreal Exposition. 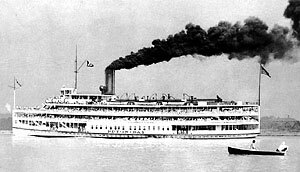 Canada Steamship Lines offered service from Detroit to Montreal and the Saguenay Fjord, with service to Toronto and other lake ports with their three ships the Noronic, Hamonic and Huronic. Canadian Pacific connected their rail heads with a cruise on either the Assiniboia or the Keewatin between Port McNicoll and Thunder Bay. With the coming of steam, fire dangers were greatly increased and numerous tragedies occurred from an almost lack of knowledge as to cause and prevention. The various Steamboat Acts called for pumps and fire buckets. But the construction of most ships was such that even in iron and steel steamers, there were wooden decks and minor bulkheads with combustible paints and furnishing. The presence of long passageways and staircases that acted as chimneys increased the ships vulnerability. All this practically guaranteed that once any fire started, it would sweep through the vessel with the explosive force of a blow torch. There have been many famous fires on the lakes. One such catastrophe has been referred to as the holocaust of September 8, 1934 when the U.S. Liner Munroe Castle burned in sight of the New Jersey coast. One hundred and thirty-seven souls were lost. The Munroe Castle, just four years old, was considered the finest and most luxurious vessel in the American passenger service, built to 1929 fire convention standards. As was the custom in all ships of the period, highly combustible linens and furnishings in the cabins and public rooms outweighed the advantages of the fire resistant partitions required by the convention. Fire swept remorselessly through The Castle shortly after being detected in the writing room. Some people were burned to death in their cabins, some escaped by life boat and a few actually swam ashore  a distance of 8 miles. 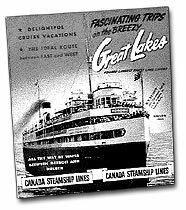 By 1949, the era of passenger vessels on the Great Lakes was drawing to a close. Ships built following a century-old tradition were almost all ghosts, their names echoing from out of the mists of the past: The Put-in-Bay, City of Detroit, The Western World. an event that would finally bring sailing vessel fire safety on board and into the modern era: the burning of the SS Noronic. In the summer of 49, the Noronic ran passengers from The Border Cities (Windsor, Walkerville and Detroi) to Duluth, Minnesota. This itinerary was revised in September, and her seven-day voyage began in Windsor/Detroit, continued to Cleveland, then onto Toronto, the Thousand Islands, and Prescott, Ontario, before returning to Detroit. On September 14, she weighed anchor from her berth in downtown Detroit at 11 a.m., crossed Lake Erie to Cleveland to pick up more passengers, then sailed through the Welland Canal into Lake Ontario. On this fateful voyage, 524 passengers, consisting mostly of Americans from Cleveland, were enjoying a late-summer excursion to Canada and the layover in Toronto. A crew of 171 looked after their safety and catered to their every whim. By 6 p.m. September 16th, the Noronic slid into her Canadian Steam-ship Line berth in Toronto  Pier 9 at the foot of Yonge Street. With her bow facing north, and her starboard side secured along the dock, passengers and some crew soon set out to venture amid downtown Toronto, a city growing in sophistication in post WWII Canada. Of the 171 crew, only 16 were on duty that night. Included among those who went ashore was the Captain William Taylor, who returned at 2 a.m.
By this hour, most of the passengers had also re-boarded, along with an unknown number of guests who accompanied passengers to the ship. It was a cool night with the temperature around 60 degrees and a steady wind from the southwest. Many of those who remained on the ship would not live to see the sunrise. Instead, their peaceful slumber would become a collective nightmare of panic and chaos  fire on the water.